Can you believe the first weekend of the League coverage is over already? It’s flown by. Sadly it might not have been the weekend we expected. But nonetheless here are the details from the results from yesterday and today. 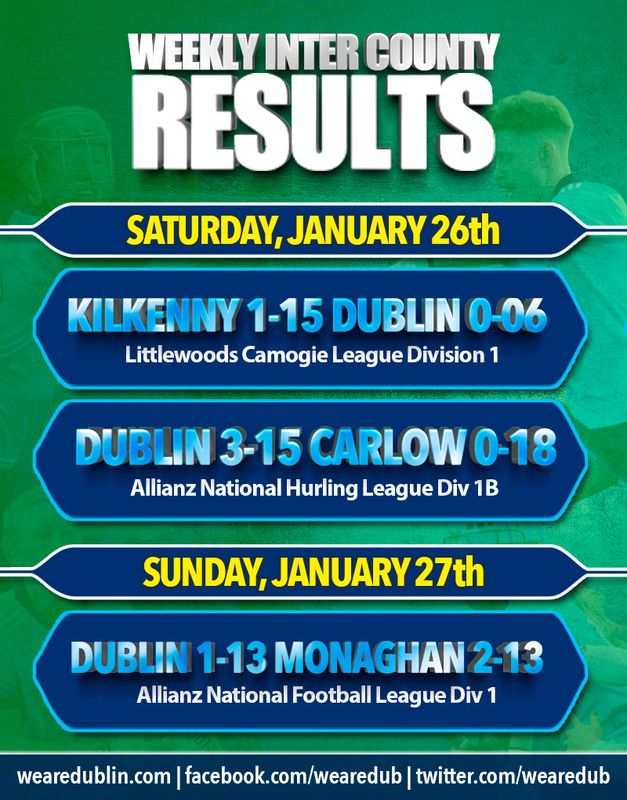 Reigning League Champions Kilkenny hit Dublin with a second half scoring onslaught to claim the points on offer in Callan yesterday afternoon. And it was a baptism of fire for new manager Frank Browne. It was in complete contrast to the first half as Dublin put it up their hosts with a mixture of aggressive but fair tackling, good movement and quick delivery to the forwards. The result of that approach resulted in Dublin taking a one point lead with them into the dressing room at half time, it could and should have been more, but Dublin were left to rue a couple of missed frees. Any chance though of a memorable win for the sky blues was quickly evaporated as Kilkenny emerged for the second half with renewed vigor and a couple of early personnel changes and an increased pace to their play saw the home dominate the second period. Dublin now move onto a home fixture next weekend against Offaly in the next round and will be looking for the win to recover from yesterday afternoon. Darragh O’Connell, Eamonn Dillon and Donal Burke delivered three goals for Dublin last night to earn themselves their first hurling league victory of the season. And it’s the second time they’ve beaten Carlow in recent months, having taken a win over the Barrowsiders in the Walsh Cup back in December. That puts Mattie Kenny’s side in the driving seat ahead of next weekends Round 2 fixture against Offaly in O’Connor Park. Carlow went in at half time two points the better on an 0-11 to 1-06 scoreline. But the Dublin manager made some subs that had an immediate impact. Donal Burke, Danny Sutcliffe, Tomas Connolly and Oisin O’Rorke all played a huge roll in their second half performance seeing Dillon and Burke net goals to take the game completely away from their opponents and drive home the win. For Carlow, Marty Kavanagh was their player of the game scoring 0-12 of their 0-18 tally, but even with that performance Dublin finished stronger with goals ultimately winning the game for the home side. Second times the charm for Monaghan this afternoon as they beat reigning league champions Dublin again in league action. Dublin 100% record in St. Tiernach’s Park came to an end. Goals from Stephen O’Hanlon and Shane Carey helped Monaghan to their victory. Niall Scully netted early on for Dublin as they raced into a five point lead, but Monaghan gradually closed the gap before half time. The Dubs started the second half on the front foot, with Dean Rock and Con O’Callaghan doubling their two point lead to four. jack McCarron clawed one score back before Stephen O’Hanlon levelled the game with his goal in the 44th. Shane Carey’s green flag in the 49th. Monaghan were 5 clear with 51 minutes on the game clock. Dublin subs Ryan Basquel and Cormac Costello aided their side as they mounted a comeback attempt. Con O’Callaghan’s free in additional time left 2 between the sides but Conor McManus had the final say, safely guiding a free between the uprights to record a massive opening day win for the Farney men. Dublin return to Croke Park next weekend to face their opponents from last year’s League Final, Galway for Round 2. And there you have it. Three games, one win, two losses. Next weekend will see the Dublin Senior Ladies start the defence of their Lidl National Football League crown as they face Donegal in Croke Park ahead of the Dublin Senior Footballers. The Dublin Senior Camogie side are at home to Offaly in the next round of the Littlewoods Ireland Camogie League. And Mattie Kenny takes the Dublin Senior Hurlers to Tullamore for Round 2 of the Allianz National Hurling League.